The class actually proceeded in a fashion similar to the Louis CK one, although instead of opening with the video, we started with “Satisfaction,” by the Rolling Stones. 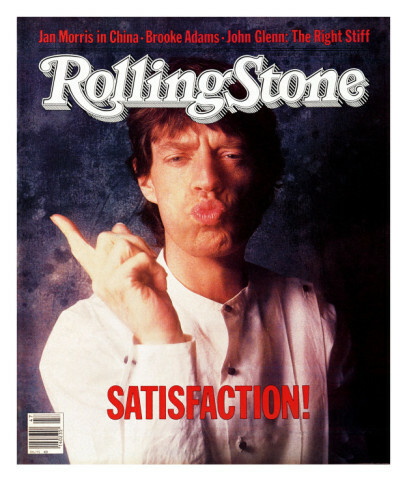 Jagger’s idea — one that is expressed well in the vocals and the driving beat of the song itself — is that he cannot ever get any satisfaction: girly action doesn’t do it, smoking the right cigarettes doesn’t do it, having very white shirts can’t do it. No matter how hard he tries, he is unable to find lasting satisfaction in the impermanent objects of the external world. This is the First Noble Truth — the truth of dukkha. And it’s something that sixth graders can grasp: they can feel the pulsing, relentless energy in the song, they can understand the lyrics, and they can connect to their own restlessness and desire for new situations or stimuli — the Second Noble Truth, the truth of the cause of dukkha. They can begin to see a little bit what the Buddha was talking about — both the thing he called dukkha and the restless, grasping energy that underlies it. At this point in class we discuss the Four Noble Truths, using the 2×2 format mentioned above. We talk about the relationship between cause and effect, and try to understand why the Four Noble Truths are in this order. Why does the Buddha talk first about the effect, and then about the cause? This ordering seems a bit counter-intuitive, so to try and understand that, we turn to a cartoon and an old metaphor from the Buddhist tradition itself. We talk about the relationship between the patient and the doctor. First, the patient realizes that there’s some kind of sickness. Then, the doctor tries to figure out what’s wrong — what is causing this sickness? 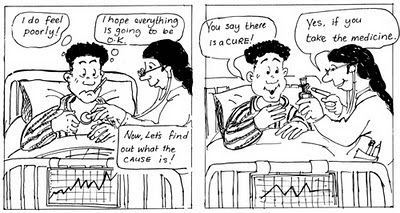 Third, the doctor assures the patient that there’s a cure. However — as in real life — there is a catch. The patient must take the medicine. We talk about this idea as a class, connecting it to our own experiences with sprained ankles and strep throats and the like. Then I tell the students that traditionally, the Buddha was seen as a doctor. What do they think are the connections between this cartoon, Doctor Buddha, and the Four Noble Truths? After some partner discussions (or perhaps some individual silent writing), they make the connections. The First Noble Truth, the Truth of Dukkha, is Buddha’s diagnosis of the human condition. It’s our current state, the one thing we can understand right now. (This is probably why it comes first, even though it is an effect and not a cause.) The Second Noble Truth, the Truth of the Cause of Dukkha, is Buddha’s understanding of what causes us to have dukkha: we have negative karma, and afflictive emotions, and a misperception of ourselves and the world we live in. However, there’s good news as well: the Third Noble Truth, the Truth of Nirvana, the Cessation of Dukkha. Total health is possible. In fact, it’s possible to reach a place where we are never sick again. But, the only way to get there is to take the medicine: the Fourth Noble Truth, the Path to the Cessation of Dukkha. In addition to talking about this path as having three major parts (ethics, concentration, and wisdom), I also tell students that we can think of the Buddha’s advice here as having two parts: there are things we are doing that we must stop doing, and things we’re not doing that we must begin to do. In other words, things to put down and things to pick up. We also talk about how getting healthy thus depends a good deal on the patient. Even if I have great faith in my doctor, or believe that she is the best doctor in the world, the only way I will get better is if I follow her advice, stop eating so many darn Doritos and learn to like quinoa and kale. Maybe I should send this post to Keith Richards. This entry was posted in Buddhism, Lesson Plans and tagged Buddhism, Buddhism lesson plan, Four Noble Truths, Four Noble Truths lesson plan, lesson plans, Mick Jagger, religion, teaching by teachingasianreligions. Bookmark the permalink. Did you know that Keith Richards is writing a children’s book?